How is that even possible I pondered? My heart was breaking as I stared at Huffington Posts online article that Wednesday afternoon. What could I do? 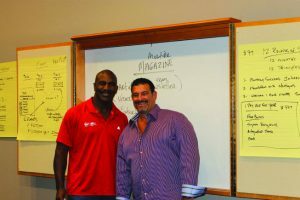 How could I help my sports hero Evander Holyfield? At the time, I was the founder and CEO of Crown Financial one of the largest Christian Debt Relief companies in America. After careful consideration, I penned a 4-page handwritten letter to Evander, sharing the details of an encounter and random breakfast that I was privileged to enjoy with the late Whitney Houston back in the summer of 1996 in Aventura Florida. At the end of the 4-page Whitney story, I encouraged Evander that most of humanity faces very similar challenges in life, albeit finance, family, fitness, friendships and even faith. I invited “The Champ” into a new possibility to overcome his obstacles with my assistance and a week later I was sitting in the lobby of The W Hotel in downtown Atlanta have breakfast with “The Real Deal” and my new client Evander Holyfield. Over the years I have helped Evander re-invent his career outside of the ring endorsing companies, and sharing his story as a celebrity speaker. Evander is as healthy today as when he beat Mike Tyson for the heavyweight title back in 1996. The $400 million dollars that he earned and spent during his boxing career doesn’t really bother him today. Often times when working with clients I hear them say things like; I’m not smart enough, I’m not good enough, I’m not strong enough, I’m not successful enough, I’m not handsome enough, I’m not pretty enough, I’m fat, I’m ugly, I’m a failure, I’ll never be successful, I’ll never lose the weight, I just can’t do it! Now, if you want to be right about these things you can, but are you inspired to be the best version of yourself with this kind of Self-Talk? Are these the kind of affirmations that are going to increase your faith? Are you going to trust yourself at a greater level by reminding yourself about all of your past failures? The answer is NO! Now, I don’t know your exact situation or the pain that you carry, but one thing I do know is that your past doesn’t define you, it prepares you for a bigger brighter future then you have ever dreamed possible. Here is the key that I taught Evander, and that I will now share with you. Be GRATEFUL for all that you have been through in the past, be GRATEFUL for where your life has brought you today, and get clear about what you want to create in your future, make a plan and go for it! Allow yesterdays curse to become today’s blessing! Be GRATEFUL! Previous What Is Bell’s Palsy?